1 Cut the tomatoes into quarters and remove the seeds, taking care to remove the stems. 2 Cut flesh into 1 cm (approximately 1/2 inch) cubes. 3 Rinse scallions, trim and cut into 1/2 cm (approximately 1/4 inch) thick rings. 4 Rinse fennel, cut in half, remove the stalk and chop bulb finely. 5 Halve fresh chile pepper lengthwise, remove the seeds, rinse and finely chop. 6 Rinse cilantro, shake dry and chop the leaves. 8 Mix prepared ingredients with 1 tablespoon lime juice and oil. Season with salt and 1 pinch of sugar. Before serving, refrigerate and let marinate for at least 30 minutes. 9 Cut the salmon fillet into 12 equal cubes. 10 Crumble dried chile pepper, mix with black pepper (to taste) and the remaining oil and pour over the salmon. Let marinate 15 minutes. 11 Season salmon cubes lightly with salt and place on 4 wooden skewers. Heat a grill pan and grill the skewers on all sides 4-5 minutes. 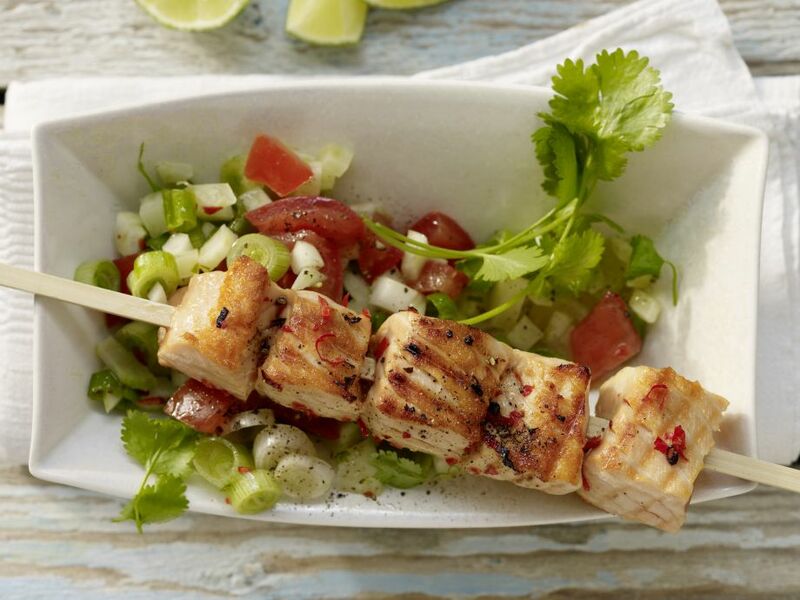 Arrange salmon skewers and salsa on plates and serve with lime wedges, if desired.